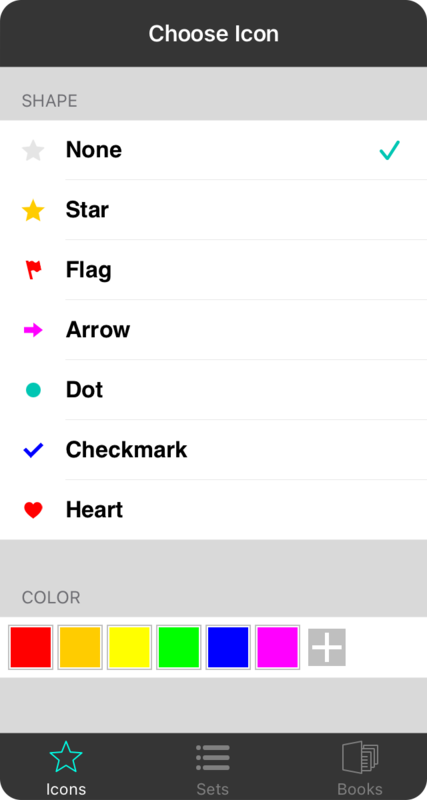 The organizer menu lets you quickly mark a song with an icon, or place it into books or sets. In just a few taps you can create new books and sets and organize you songs. Let's take a look at the tabs that comprise the organizer. Icons are small graphics that appear next to songs within lists. These can be used to abstractly categorize songs. For instance, you may use a star to indicate favorite songs, or a flag to represent songs that need more practice. Sets are collections of songs to be played during a specific event. This lets you pull songs and place them in an order of how they should be played. This tab shows the sets that a song is in at a glance. You can also create new sets and place songs within them. Books are used to organized large collections of songs and are useful for dividing your library by genre, band, leader and more. This tab shows the books that a song is in at a glance. You can also create new books and place songs within them.